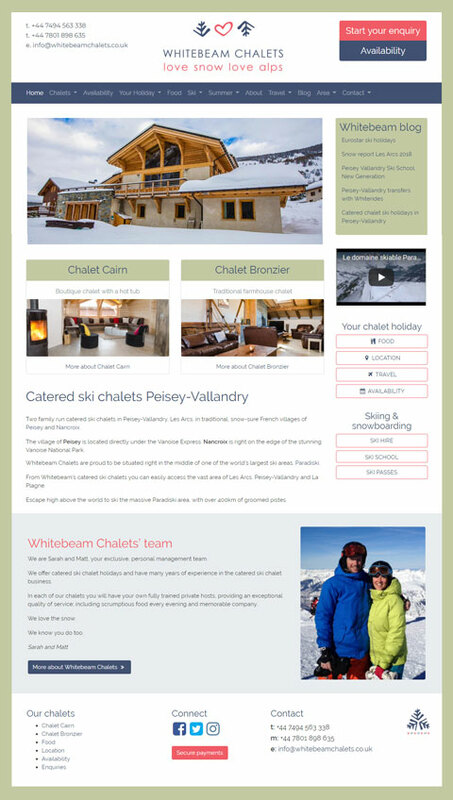 This chalet company website takes advantage of the WordPress platform. I developed a bespoke theme using Bootstrap 4 - a mobile friendly framework. The theme has been left clean, with minimal unnecessary code. It is fast to load and consequently much better for search engine rank. I reduced the use of WordPress plugins, to keep the site running quickly. The main aim of this chalet company website is to help users find information quickly and build an informative site about the area for customers and search engines alike. Customers find the site useful, and will return. Something search engines track. Returning customers means higher search rank. I direct the writing of the blog area twice monthly to build a larger online presence and gain an authoritative voice in the Peisey-Vallandry area, and in the mountain sport business. Each month I analyse how well the website ranks for industry key terms. I target more and more keywords for which rank is within reach. An intelligent way of optimising a site for search engines. I also do some brand awareness for this chalet company, building customer trust. Using content from the blog I often send out e-newsletters to the Whitebeam client base to encourage traffic and interaction.